If you're looking for a tasty treat for the upcoming Superbowl, this is a fantastic dish to serve at your party. Prep time takes a bit of time but it's not at all difficult. And putting the tacos together at the end is extremely simple. In fact, I like to put out all the elements and let everyone build their own tacos. Growing up in SoCal I was spoiled with legit, authentic delicious tacos. My favorite -- al pastor -- are practically impossible to find outside of Cali or the Southwest. So, I'm left to recreate my own. 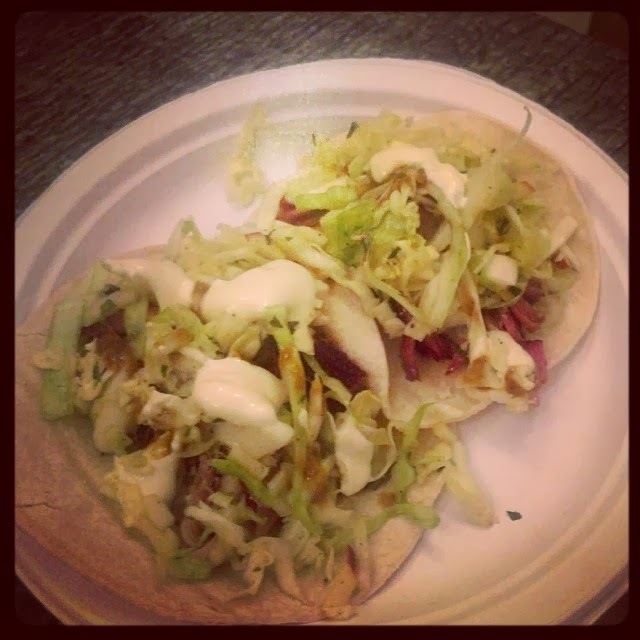 I had a version of tacos recently at a local restaurant that were outstanding, and did a nice spin on it: smoked pork in corn tortillas with a cabbage slaw and a sweet crema sauce on top. I loved it. This is my version, using pork that we started on the smoker and finished in the oven. My slaw is a combination of green cabbage with crisp tart green apple, finished with smoky hot sauce and bright apple cider vinegar. My sweet crema is simply sour cream, honey, and lemon juice. I love a good sprinkling of cotija cheese right on top too. Some fresh cilantro never hurt nobody either. Enjoy it! Check out the link above to get the BBQ rub I like to make. If you have a rub you love, go ahead and use that. Take the pork and set out on the counter to come to room temperature. Take the rub and rub the entire meat all over -- including up and under crevices -- in a thick layer. Let it stand at room temperature with the rub on for an hour while you prepare your smoker or preheat your oven. If you're going to smoke it like we did, preheat your smoker and prepare your chips. Begin smoking the pork as usual. We smoked our pork for about 3 hours and then finished cooking it in the oven with the braising liquid. Conversely, you can do the pork entirely in the oven without smoking it also; simply sub out the beef chuck in this recipe with the pork and cook until fork tender. If you're really in a pinch, you can buy store-bought. Whole Foods makes a decent pulled pork. Either way, the end result is you want fork-tender pork that you can then "pull" apart with two forks so you have a heap of shredded delicious meat. Set aside. For the cabbage slaw, cut cabbage in half, then in quarters. Cut out the core and discard. Thinly slice the cabbage into thin strips and place in a large mixing bowl. Take the apple, core it, cut it in half, and cut into thin match-stick strips. Add to the cabbage. Add the cilantro. Season with salt and pepper to your taste, add hot sauce and the vinegar right on top, and toss to combine. Add more or less of the hot sauce (or type) to suit your spice level. Once everything has been evenly coated, cover and let stand at least an hour for the cabbage to wilt a little. You can even make the cabbage a few hours or even a day in advance; just keep covered in the fridge and toss it once or twice. To make the sweet crema, simply whisk together the sour cream, honey, and lemon juice together. Add the honey 1 tablespoon first and taste, adding more if needed. Some honeys are sweeter than others, so adjust to your taste. This can be made up to a day in advance and kept in the fridge covered until ready to use. To heat the tortillas: place the tortillas in a pile and wrap with a kitchen towel. Microwave for 1 minute. Keep in the towel to keep fresh and warm. To serve up the tacos, simply take a tortilla and fill it with some pulled pork. Add some slaw, crema, then top with cheese and more cilantro if desired. Add hot sauce and fresh squeeze of lime if you like. For a party like Superbowl especially I like serving these buffet style, so I'll put out a big aluminum tray of the pulled pork (this way I can keep it warm in the tray easily), the tortillas wrapped in the kitchen towel to stay warm and pliable, and all of the condiments out for everyone to help themselves. *Bone in is going to taste better but take longer. Make sure you allot the right cooking time depending on which you end up working with.